Sick of hearing myths like: "You can't run a car factory with renewable energy..." ? Renewable energy CAN provide 24/7 power and it can provide it at a lower cost than large centralised power stations. Plants have had millions of years of evolution to perfect collecting and storing solar energy. They remove carbon dioxide from the atmosphere and produce oxygen at the same time. 100 tonnes of biomass is created by combining 150 tonnes of carbon dioxide, 60 tonnes of water and a large quantity of sunlight (aka Solar Energy). 110 tonnes of oxygen are released. We do not need to grow special energy crops. The most efficient plant is one we call a weed. Water hyacinths can grow 90-180 tonnes of biomass (dry weight) per hectare in a year. 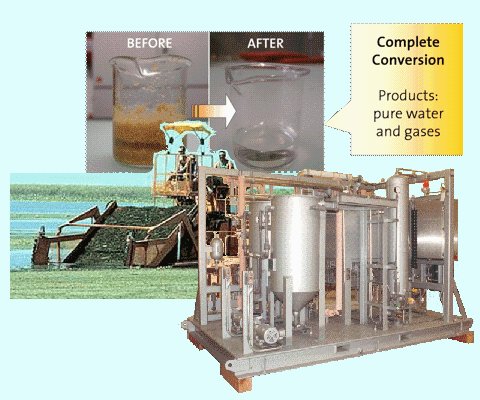 It clog rivers and removes excess nutrients from polluted waterways. 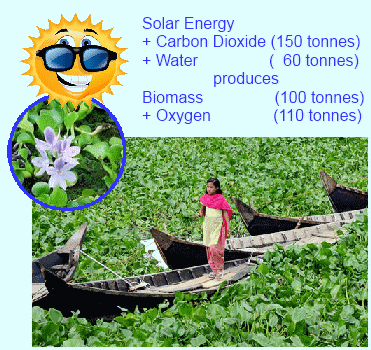 100 tonnes of water hyacinths (dry weight) stores 1,600 gigajoules of solar energy. US developers and Swiss researchers have built and evaluated the technology needed to convert wet biomass into renewable natural gas: Each 100 tonnes of biomass is converted into 25 tonnes of renewable natural gas. 75 tonnes of carbon dioxide is released that can be cheaply captured and stored. We can easily go beyond Carbon Neutral energy production and Zero Emissions. Plants give us the option to use affordable technology to be Carbon Negative. For every 100 tonnes of biomass collected and converted into renewable natural gas, 75 tonnes of carbon dioxide can be permanently removed from the atmosphere.